Born 06/10/03 so nearly three and a half. My parents have always had dogs but it had never been practical for us to have a dog. After a great deal of thought we decided to get a dog. 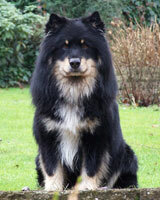 The Finnish Lapphund seemed to fit the bill when searching for a dog to suit our requirements – gentle, good with children, good with cats, trainable, happy to relax or come on long walks. I would not say the training was challenging but rather essential. Training in our house started from day one. Kimi has been very eager to please so spending time training him has been very beneficial. Kimi was at his most challenging at 10 months to about 18 months so this bought some issues around training during this time. Now there’s a question. Kimi does not do fetch he finds it boring. He is also not fond of ball games. He likes doing tricks for treats – dance, high five, play dead, speak, catch etc. He has also done well at more traditional training with -finish, down, distance down and heel. I have found Kimi very quick to learn. The effort and time you are able to put in is more the issue. Kimi’s keen and eager to learn. He is very clever. Dry for breakfast and dinner. Some meals are replaced with raw chicken wings or meaty marrow bones. 75 grammes for breakfast and the same for tea. Treats of carrots and raw veg especially broccoli at meal times or during the day. No but he would if he was allowed to eat everything he wanted to. There are lots of children popping in and out of our house. It was essential that I had a dog that would be fine with children. Kimi is great. He is nosey and likes to see who has come to the house but then goes and does his own thing. He is not a guard dog but a watch dog. He does not bark at the door during the day only at night. He has to lie down before I open the door so he can see who it is but is not allowed to approach until I say so. I am very conscious to make guests feel comfortable in Kimi’s presence. In general he is fine with other dogs. He is not keen on Boxer dogs because he was beaten up by one as a youngster. He is assertive but has learned that we only tolerate polite behaviour with other dogs. If he meets and greets other dogs nicely he and they get treats. Fine with the ladies – not so keen on other male Lappies on his patch. I would say Kimi is a very stable dog. He has been attacked badly twice and this has not affected his personality. He is assertive but has never initiated any trouble. He wants to be boss but returns to us at the sign of any trouble. He loves to chase deer and has caught a squirrel but did not know what to do with it until Mark shouted ‘leave it’ and he dropped it. .There are cattle on our common but Kimi is now so used to them he just ignores them. He is excellent most of the time but like most toddlers they will periodically try and take liberties. I try and spot this and back track on training for a week or so to get Kimi on track again. Has a definite personality and is very much part of the family. Much more trainable and sensible than both the other breeds. More eager to please than a schnauzer.